Over the years, I've "come around" to loads of games I initially found underwhelming (or worse). A few examples I've written about as part of my on-again, off-again "Second Chances" series: Bubble Bobble Junior for the GameBoy, Don Doko Don for Famicom, Magical Taruruuto-kun for Game Gear and Valkyrie no Densetsu for PC Engine. Why I've yet to publish a "Second Chances" entry on Hudson Soft's Bikkuriman World is beyond me. 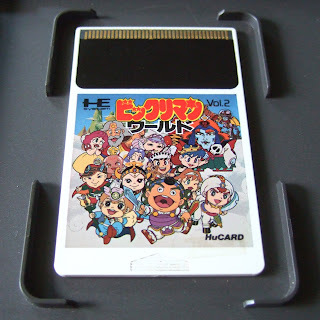 After all, while my first experiences with this PC Engine reimagining of Sega's Wonder Boy in Monster Land left me feeling unimpressed, my opinion of it improved substantially following subsequent playthroughs. That's not to say my negative early impressions of Bikkuriman World weren't warranted. The game features tiny character sprites, a rather intrusive HUD (status bar, basically) and controls that are equal parts slippery and stiff. Later jaunts through its adorable environments were far less annoying. The complaints I just leveled at the game remained true, of course, but some of them slowly, but surely, morphed into aspects I either accepted (its controls) or appreciated (its graphics). 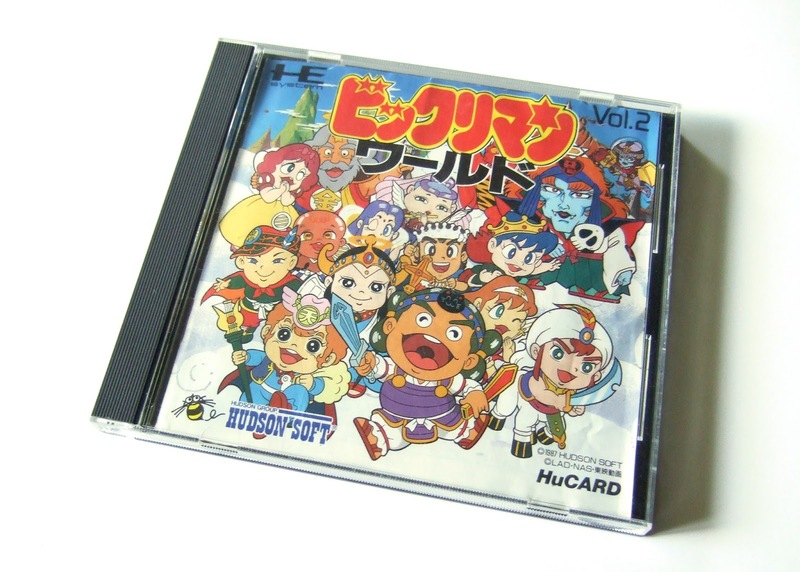 A few things I didn't have to come around to regarding Bikkuriman World are its HuCard label and manual cover. Both are showcased in the photos above. Even when I wasn't a fan of the game, I still liked the chibi character illustrations that are the focus of its cover and cart-label art. I've always long loved the bubbly Bikkuriman logo, too. Sadly, the instruction manual packed inside copies of this side-scrolling platformer isn't quite as visually impressive as that booklet's cover imagery. 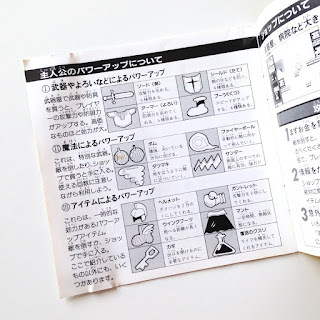 To see what I mean, check out my "Manual Stimulation" post about Bikkuriman World. Also, if you're a PC Engine fan in general, keep an eye out in the coming weeks and months for more "Nice Package!" posts devoted to games made for NEC's console. In the meantime, enjoy the ones I've already published about Dungeon Explorer, Pac-Land, Parodius Da! and Son Son II.